Great analysis - thanks for the link! Mind - you do know that natural variability is when there's a very cold and snowy winter in the UK, while everything else is of course global warming! Nice post, some very good points. "since one of the widespread proofs is the old chestnut - 'recent warming can't be explained by natural processes alone.'" Exactly. You can only make that statement if you know what those natural processes are. The current 12 year flat trend shows that they are clueless because CO2 is climbing as fast as ever. "Perhaps they've run out of excuses to add adjustments to the data." They won't give up so easily, Eugene. Someone recently gave me a Met office link where they claimed that it was still warming because they could take certain regions of HadCrut data, combine them with certain regions of satellite data, and come up with a composite that showed warming. I could only shake my head. I should have kept the link. Great work. That is an excellent article. Do you not think that between the first IPCC report and the most recent, more evidence has been recieved, and therefore past temperature records have been refined to become more accurate? The reason that AGW is recognised as such is because it is produing changes that are over and above what we would normally expect as natural variation. Could you please, then, give me an alternative hypothesis (preferably referring to papers in recognised peer-reviewed journals) that will simultaneously explain the increase in atmospheric C02 over the past 150 years, the fact that, through isotope analysis, that CO2 is produced by human activity, the correlation between the increase in global temperature over that period, and the fact that ocean acidity is increasing, glaciers are receding, species are moving northwards, and the myriad other pieces of evidence that suggest that warming is happening and that it is being caused by human beings. "Do you not think that between the first IPCC report and the most recent, more evidence has been recieved, and therefore past temperature records have been refined to become more accurate?" More things like Mann's fraudulent hockey stick have been received. The temperature records have been refined to be less accurate. "The reason that AGW is recognised as such is because it is produing changes that are over and above what we would normally expect as natural variation." No, the kind of natural variation that we are having has happened many times in history. 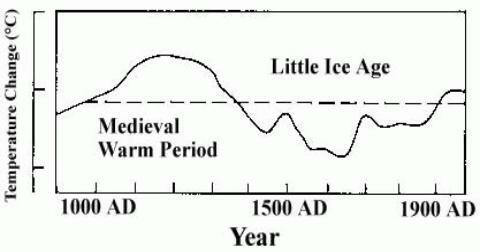 There has always been a correlation between CO2 and temperature. Even when man was not producing the CO2. But temperature was leading CO2. Furthermore, there were times when temperatures went up followed by CO2 going up - and then temperatures reversed direction, even though CO2 continued to rise. This indicates that the CO2 forcing could not have been all that strong. "and the fact that ocean acidity is increasing,"
The ocean acidity is not increasing. It is only getting less basic. The fact that warming is happening - or at least was until 1998 - does not mean that humans are responsible for it. The earth has been either warming or cooling for all of it's 4.5 billion year history. It doesn't need humans to make it happen. And all of the other things that go with warming - like glaciers melting - have also happend on and off for most of the earth's history. There is nothing extraordinary going on. I don't have the link any more, but there was an analysis of the effects of reduced alkalinity in the oceans on diatoms and other shelled denizens. In a nutshell, it accelerates the cycling of calcium; it speeds the dissolving of dead skeletons/shells, and improves the organisms' access to calcium for new shells. So it just revs the engine, with more net usage and hence a HIGHER level of life and survival for them. As usual, 180° opposed to the explicit and implicit message of the warm-larmists.